After a fraught Spa 1000 Kms, Frank Hahn’s G-Force team has made a very rapid recovery. Following the accident at Spa, the team has built up its Courage C65 ‘rear end’ around a replacement tub from Courage Competition, and Frank Hahn shook down the rebuilt car at a local airfield on Friday (May 26). 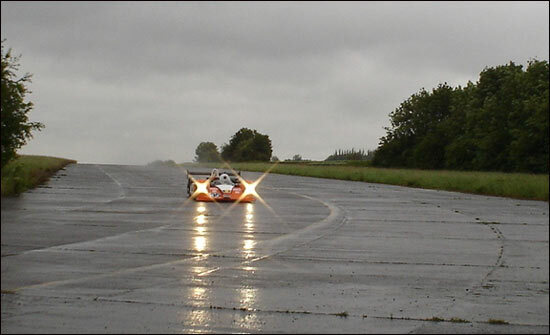 The main objective was to test all the systems before making the trip to Le Mans. That’s Jean-François Leroch and Ed Morris, of course. Frank Hahn competed in the race last year, so he doesn’t need to complete the 10 laps. Ed Morris – no longer 17 years old any more, having just enjoyed his eighteenth birthday – is likely to play a key role in G-Force’s second Le Mans, but the whole project will be a team effort, as it always is in the 24 Hours of Le Mans.